You need to invest more in your marketing. The ‘Why’ and the ‘How’. How many of your sales team are hitting their targets? (The average is just 53%). How much of your time is wasted on sales leads that have no chance of turning into a deal? How many of your customers are a pain in the backside, taking hours of your time to manage? Motivate your customers to recommend you. Who’s doing it well, and how? Start by asking yourself “How did all the big brands I know about, get to be so successful?” No matter what industry they’re in, the most successful companies have got to where they are by making sure they attract the right customers with the right messages and then look after those relationships. In simple terms, they invest in marketing. Marketing spend within these companies varies from 10% all the way up to 50% of their revenue, depending on the market they’re in and where they are in their growth journey as a business or for specific product ranges. What percentage of your revenue are you spending on marketing? These companies understand that without the right customers coming through as sales opportunities, even the best sales people can’t sell enough of the best product in the world to hit growth targets. This is where the investment in marketing pays off. When planned and executed well, it delivers a predictable pipeline of high quality sales leads, that are ready and willing to speak with your sales team and get involved in deeper conversations where the sales person can use their skills to show the customer how the product will benefit them. What do you actually sell? Your proposition. It’s obvious isn’t it? Well, quite often, you can miss a sale very early on, because you haven’t articulated what your product actually does for your customer, in a language they understand. A good place to start is to answer a question from a potential customer: “How will my life be better once I’ve used your product?” That, in simple terms, is really what the customer wants to know. Whether it’s a health food product or a complex engineering product, people buy products because they have a need, so you need to tell them how you will satisfy that need. This is often known as your proposition. To create your proposition, write out words that identify what your product does and the benefits it brings to people. Then pick the biggest benefits and start to put together a sentence that you could say to someone if they asked you “How will my life be better once I’ve used your product?” A great tip from the ‘Talk Like TED’ book by Carmine Gallo, says you should look to do this in 140 characters, and then create supporting points, 3-4, that you can use to explain how you deliver this benefit. The book suggests examples, statistics and points of view. Next, you need to define who your ideal customer is. Look at the benefits your product brings and identify where the best opportunities for its use are. Are there any customer groups where your product has done well in the past? Which customers are in sectors or segments that are changing and would benefit from your product? I’d recommend that you start by focusing on 2-3 target groups / ideal customer profiles. Choose one you’ve had success with before, one that you feel you could get some quick leads and sales from and one more that will take longer to develop the sales leads, but will become a large source of leads in the future. Get to know your ideal customers. Once you’ve identified your top 3 ideal customer profiles, you need to get to know everything you can about them. This will give you a great insight into what your marketing content should be targeted at and what benefits you can bring them. You can conduct surveys with your existing customers, use social media and most valuable of all, look to the great pool of research and insight that’s available online. For insight into business sectors, take a look at the Industry Insights on the Beyond-Consulting website. The kind of insight you need to know is – What’s happening in their market? What are the key facts and figures about them and their market? What are the big focus areas for them at the moment and over the coming years? What are their big goals? What opportunities are there for them?…and what are the challenges. Collate all your research into profile overviews for each of the ideal customers and refer back to it whenever you’re creating any content or customer journey. The basis of a great marketing plan is the Customer Journey. This is your map to identify what actions you need to take at each stage of the buying process, to build your ideal customer’s understanding that your company provides the best solution for their need. 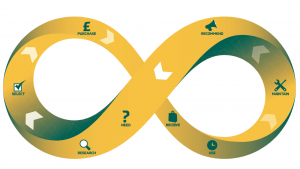 In the early stages of the Customer Journey, known as the Need and Research stages, the customer will be triggered into needing or wanting to find a solution to either solve a problem or help them reach a goal. The thing that triggers this need can come from either within their own company, by recognising they don’t currently have the capability or from an external source, such as an article in an industry publication or evidence of a similar business tackling a situation that they find themselves in. They then move into a period of research, where they use all their favoured and trusted resources to find out how similar companies have solved the problem, identify what products and solutions there are available in the market, what they should specifically look for their particular situation and finally what providers there are in the market, that look trustworthy and are worth contacting. These early stages on the Customer Journey take up about 50%-60% of the buying process and it’s important to know that the vast majority of it is done without speaking to someone in your sales team. The favoured and trusted resources they use will be thought leaders in their industry, industry publications, social media, networking contacts and connections in similar companies, and they’re looking for helpful, easy to understand information that shows them how to meet their need and where they should focus their time on finding the solution. Moving on into the sales interaction, the Select and Purchase stages are where you pass over the high quality leads into your seals team, for them to work their magic. Once the purchase is made, you need to ensure you create a great customer experience through the Receive, Use and Maintain stages, so the customers buys again and will recommend you as a supplier. If you deliver a great experience through the customer journey, it’s very possible that your customer will see you as a valuable partner, rather than just another supplier. Content that cuts through the ‘Me too’ messages. Now let’s get to creating the content and campaigns. Use your proposition as the basis for your content and the actions from your customer journey to guide this. This is what nurture campaigns are all about – developing the buyer’s trust in your business and their understanding and belief that you are the best company to help them. Create content that is useful, informative and shows your knowledge in both your specific product and industry area, and theirs. You need to use the content to show them how you can help them overcome their challenges or reach the opportunities that are in front of them. Only pass to sales when ready – Lead Scoring. To address the issue of sales wasting time on leads that don’t go anywhere, set up lead scoring , which puts a value to the interactions a buyer has with all of your content, so you only pass leads across to the sales team when the buyer has shown a decent amount of interest in your product and company. CRM software should be a well-used tool in your organisation, but not many have gone further and started using a marketing automation platform. This type of software goes beyond email marketing tools, because you can set-up multiple campaigns that involve email, website visits, social media interactions, events and more, to deliver personalised content in fantastic nurture campaigns. By automating the day to day delivery of personalised content, you can spend your time analysing the reports to create improved campaigns and content, as well as moving onto another set of target customers. With some great marketing automation tools on the market, you can choose the one that fits your needs and integrates with your CRM software to pass over leads. They vary in cost from free, up to £000’s per month. If you’d like to meet up to find out more about how you can get more high quality sales leads, give me a call and with my 18+ years’ experience in marketing, I’m sure I can help you in some way.